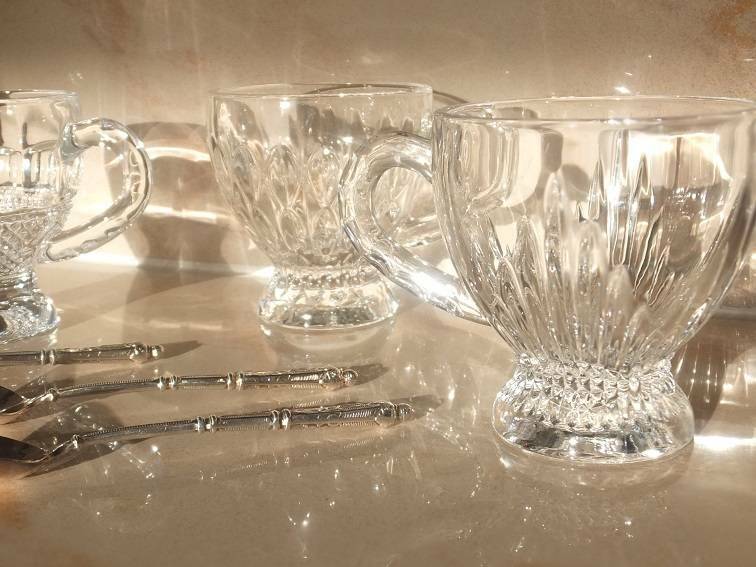 Exclusive elegance for bistros and cafes - Glass coffee cups with ornament & cups with gold rim. Tastes are different - so it is hardly surprising that successful bistros and cafes concepts do not even try to reach all guests, but consistently dedicate themselves to a target group and your needs. Unfortunately, those who are exchangeable inevitably lose to attractive competitors. After that, only the only selling point is the price. A strategy that is often the beginning of the end. The best idea is - to satisfy the individual needs of your clientele. It is not just about the taste, but also about exclusivity. The guests want to be convinced with added value or with experiences that they do not receive elsewhere, or only know from abroad. Meet the taste of the clientele, look for an offer / recipe for a coffee or cake / pie even the kind of serving that clearly sets you apart from your competitors. Start with the cups - glass cups for cappuccino or espresso (have long been used by Italians and French especially in the noble districts) - you reach three sensory organs your customers at once - eye, nose, taste. Serve your exclusive pastry creations on the special porcelain - also with gold rim (by the way is dishwasher-safe ...). Customers today are no longer looking for any bistro or cafe. They are increasingly looking for the special experience.